One of my favorite buildings in the Holiday neighborhood, the Crescent wraps around the community park and has million dollar Flatiron views. The secure building lives like the high-end Downtown units, and speaking of Downtown, it’s only a 5 minute bus ride away. The architecturally significant weeHouse #20 has it all: open living spaces, hip finishes and an incredible view of the Rocky Mountains. Combine this with the treed acre lot and its like living in a piece of art. Renovated from a mid-century apartment building in 2008, the Balsam Flats is all about location, location, location. In this spot, you’re walking distance to Ideal Marketplace, Vic’s Coffee, North Boulder Park and the Pearl Street Mall. 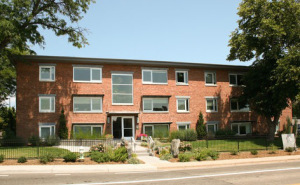 The Walnut is one of Boulder’s most luxurious residential buildings. Neslted on a quiet street one block south of the hip east end of Pearl, it’s hard to believe that you can buy an apartment with this type of quality and Downtown location for under $500,000.